Over the weekend we had the most fabulous warm sunny weather. After a few weeks of varied weather, some sunshine some showers, the bees have been nipping in and out making the most of the sunshine when they could. Last weekend we saw the dandelions bursting into life and this for me signals the start of the bee’s season. I feel that once the dandelions are in flower the bees are safe, they’ve made it through the winter and that there should now be a consistent flow of forage to help them collect enough honey to see them through this summer, the winter and the following summer should it not be a warm one. As the weather was warm I warned the bees a few days before that I’d like to give them an inspection on Sunday. I don’t like to shock or surprise the bees by suddenly appearing out of nowhere and ripping their hive apart. Of course I’m not really ripping it apart, however opening a hive can be just as traumatic as I will be breaking their winter stores of propolis. By inspecting the hive to check for health and disease I will be moving around frames which can be very distressing for the bees. It has been recognised that it can take the bees up to 10 days to restore the hive to the temperature and calm prior to an inspection. It’s because of this that I have evolved into a natural or gentle beekeeper. Conventional beekeeping teaches usto inspect colonies on a weekly basis. It can be thought of as irresponsible to leave the bees to get on with what they actually know best. I feel I like to find a happy medium where I keep a close eye on my bees from the outside and undertake between one and three inspections over the course of the year. The hive I looked it on Sunday is a ‘national’ hive and its positioned in our garden so that I can watch them from the house over the winter. It’s an ideal spot which gets a little bit of sunshine throughout the year. The entrance faces south-west and is sheltered by Holly and Firtree. It seems they also enjoyed just enough sunshine that they have been able to take cleansing flights and forging flights on any warm sunny day during the winter, as they are protected from strong winds and the cold and damp. I’ve been observing how busy these girls were and I often sit by the entrance and just watch the comings and goings. Over the past few weeks I have noticed them to be so busy that I knew the hive must be full and they will be certain to swarm early in the spring. It was therefore important that I took a look inside to check for disease and to see how the honey supplies were doing after the winter. This is the time of year that if there is surplus honey I will ask to extract it knowing that they will not starve. As they are such a healthy thriving colony I had left them with two brood boxes, two supers and one extra super only half full with frames. I leave the gaps between the frames on the top super in the winter, as if I needed to feed them I could easily pop a jar of honey into that gap. It was with such delight as I open the hive that I found these girls have been busy filling the gap drawing comb up into the space between the frames. As any beekeeper will agree this makes inspection interesting. I was able to remove the top box with the frames that also had drawn comb in. There was some pollen collected in these frames and also some capped honey. I then looked into the next box which was completely full of honey and bees. This complete box full of honey was very heavy and reminded me that I should’ve asked somebody to come and help me for this inspection. The added complication was that this honey was not all capped, so it drips! Dripping honey is not what you want when inspecting a hive. Spilling honey around the hive can attract wasps and if wasps know that there is a hive full of honey they will remember it. As their numbers grow they will keep an eye on the hive and any sign of weakness will allow the wasps to attack and invade, then stealing the honey. Luckily I was prepared for this, with a white tablecloth, and by carefully arranging the upturned lid of the national hive, I can place the complete super with honey over the lid catching any drops of honey and then cover the box with the tablecloth. This also helps to preserve the temperature of the hive. 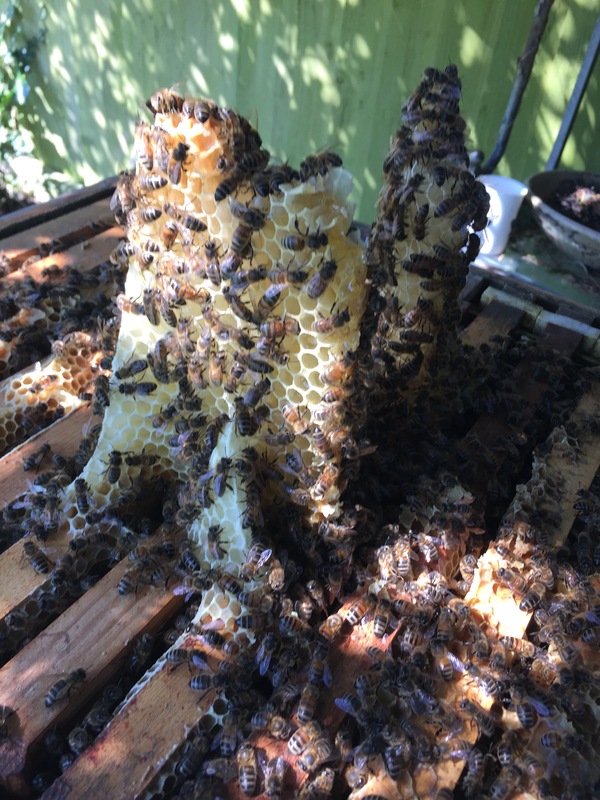 I had removed the queen excluder before the winter as bees naturally cluster into a tight ball to get them through the winter, depending on the temperature of the hive, and the location of their stores, the bees can cluster higher up in the hive. I did not want to find that the queen would be left behind in the brood box unable to get through to the supers. As I looked through the hive I didn’t remove each frame, I could see that the Queen has been active as there were eggs. Brood and pollen was abundant. The clever girls, to protect their stores in the brood boxes, the frames were half fully capped honey and half brood so there was no way I was going to take any of those supplies. In my six years of beekeeping I have never seen such a busy full hive. As I carefully looked through the hive moving boxes and carefully keeping them covered, I found that even in the lower brood box which I expected to be quieter, it was still completely covered and buzzing with Bees. I could have quite happily spent hours watching and handling them and looking through their hive. It would’ve been wonderful to have found the Queen. The outside temperature was changing far quicker than I expected and so it was important that I close up the hive as fast as possible ensuring that I haven’t lost the Queen in the process. As I replaced the hive I swapped the supers so that the one needing capping was on the top. This would mean that as soon as it was capped I could remove frames with minimum disturbance to the bees. I was so relieved to know that these bees were healthy and happy and was encouraged to see such a vast quantity of supplies despite the fact that I had taken almost a super full of honey from them before the winter. One of the things we are taught and it is important to check for is the varroa mite. You can spot them sat on the backs of bees as they carry them around unable to scratch them off. Newly hatched bees can often show signs of deformity with missing or deformed wings where the mites attacked them whilst they were in the cells growing. I fitted a Bee gym into this hive last summer, after having success with the Bee gym in my other hives. The Bee gym is placed at the base of the hive so that as the bees enter and leave they can scratch themselves against the little plastic ribbons causing the mites to drop off, falling through the hive mesh floor where they can be counted by the beekeeper. Varroa drop count can determine somewhat the health of the bees. I have been equally checking and keeping an eye on my Varroa drop over the winter and was very pleased on the fitting of the gym to notice a vast number of mites on the floor which I could then remove. During this inspection I did not find any signs of the varroa infestation, there were no deformed wings and no signs of the mites on any of the bees. I’m so excited that such a non-invasive chemical free solution can be used. I look forward to seeing more beekeepers use this excellent device instead of the chemical treatments, which varroa is increasingly becoming resistant to. I wrote a piece about the gym when I first came across them, you can read it here.